mom and i spent the day together in lake wales. there are lots of things i will share about our visit to bok sanctuary. but that will wait. early this morning as i was doing some hand watering something unusual caught my attention out of the corner of my eye. it was this big guy sitting on top of my bird feeder of all places. yep... right out in the open in my back yard. it was an odd sight given the fact that he is almost as large as the feeder and it is situated in a vulnerable position for the hawk. since i already had my car packed for our day trip, i had to do a little hustling for my camera. even though the hawk was still perching on the feeder by the time i returned to the back yard-- he quickly flew to the ground as i rounded the corner trying to be nonchalant-- then he was up to an oak limb in one swift move and down again in my neighbor's yard where i captured this photo of its gorgeous backside. i'm still trying to capture one in flight. there are several of these pairs in our neighborhood and they were all over the place this morning. 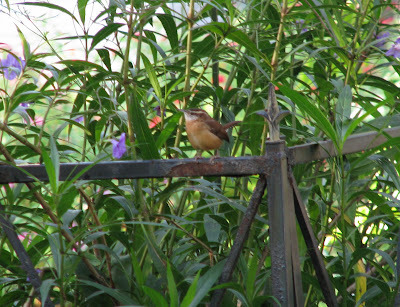 following the hawk chase and its vacancy on the feeder, this carolina wren took up the lookout position. now normally seeing these little fellows isn't all that unusual around these parts, but it isn't their usual habit to frequent bird feeders. mostly they move quite quickly and foraging on the ground in and under the brush is their favorite way to gather breakfast. these small birds have an remarkably sweet song that fills the morning air. i have oodles of photos from our beautiful day in lake wales i will get to as soon as i can. Awesome shots. I love the shot of the hawk. Birds of prey are just so cool. I love watching them fly with the speed and grace they have, and it is really fun to see them hunt. Pretty cool that you get to see them in the back yard. 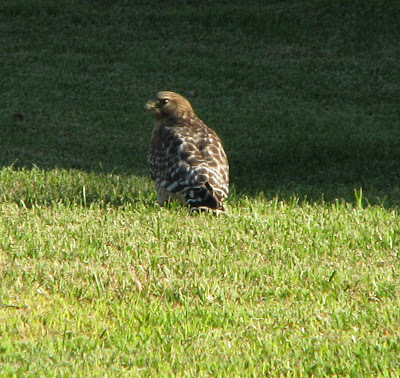 We get to see them occasionally in our yard as well and I always enjoy it. We also have a really big owl that hoots at night and lets us know he is "watching". I love hawks! He was sitting on the feeder, coz he knows breakfast will come to him there. The wrens are TOO adorable! There has been a house wren in our beautyberry this morning. The leaves are kaput, but the berries are still fine. Haven't seen the mockingbird today. Maybe he found a better bush to guard. nt: thanks for sharing your mutual love of those beautiful birds. i've been hearing an owl these past few weeks too and i keep looking for it but haven't spotted it yet. sophie: i was hoping he hadn't swooped up one of the little ones -although i know it is how the food chain works. glad your berries survived the freeze. all the flying critters around there will be looking for such plants to feed from. i like your selah/chambers thoughts too!